The onslaught of May birthdays continued with my nieces. I treated myself to a couple new herbs for the "garden" and got them settled. And rewarded myself with the fruits of my labor. I planted mint this weekend too. I just love the smell. The cake is quite beautiful. What a beautiful cake! 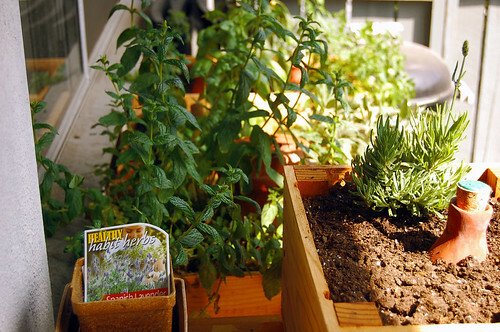 Now that I have a little bit of time this week, maybe *fingers crossed* I can get to my little herb garden! 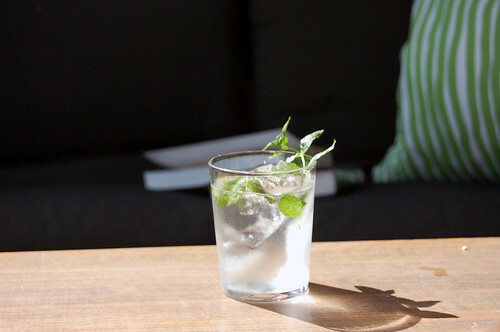 your herb garden has come along so nicely and that gin looks like the perfect way to end the weekend! 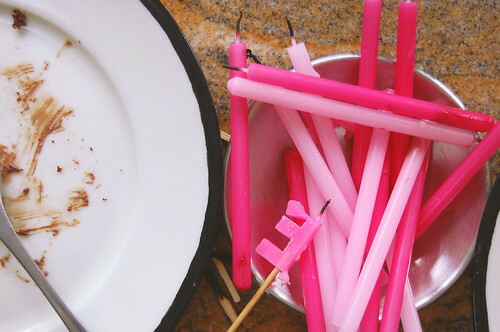 Cheery pink candles -- love how long and skinny they are. I have never tried Mint and Gin. It sounds tasty. Your garden looks like it's off to a good start. The cake looks so fun. What a lovely time. My niece would love that cake, too! All those pink candles! mmmmmmmmmmmm, you had me at cake! beautiful herbs. I noticed a terra cotta looking bottle sticking out of the dirt with your herbs. Is that one of those watering systems? Where did you get it? 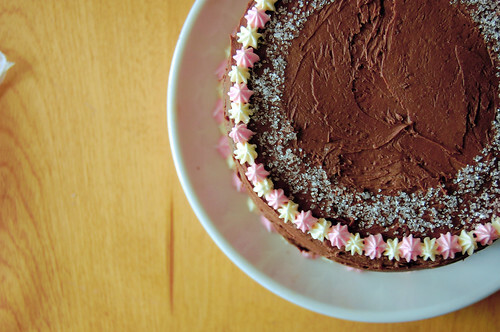 I'm drooling over that chocolate cake! Glad to see your herb garden is thriving. Mine on the other hand... Seems the only thing surviving is the mint! Time for mojitos! the drink looks divine ;-) and the cake is lovely...lucky girls! excuse me while I lick my screen...that cake looks de-lish and the drink too...slurp! I love the cake, so pretty especially the candles! Cathy - the terracotta containers are indeed my watering system. They are called ollas (oy-yas) and you can find them at some nurseries or online. To see more about them, check out my posts tagged with "garden." 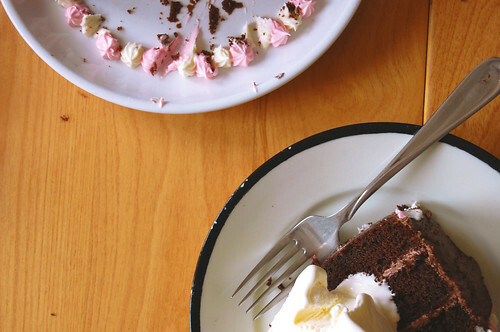 Vanessa - no worries - I licked the frosting off the plate as soon as I was done taking the photos! Sounds like May is a delicious month around your place. That cake looks delish. Looks like a yummy cake, and I just want to take a sip of that drink. Looks so refreshing! Your drink makes me want to head for the freezer for some ice. Oh and I think new herbs is a great treat for oneself. that cake is absolutely beautiful! i want to recreate it right now! and cocktails, always sound good.